By hungry runner on April 26th, 2011 . Filed under: Contests . Do you like Dixie Crystals sugar? Maybe it’s time you tell them through Facebook since they currently have two exciting cupcake related contests through their Facebook page. The first giveaway is because Dixie Crystals reached their goal of 700 “likes” on their Facebook page. 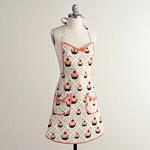 On Mother’s Day they have decided to give away 10 of the Jessie Steele cupcake aprons pictured to the right. The aprons retail at $34.00 so it is definitely worth becoming a fan to win this prize! Their Facebook page simply says “stay tuned” which means you have to “like” them to find out more details to enter the contest as Mother’s Day approaches. You could also win a $500.00 gift card by uploading a picture of your homemade cupcakes to their Facebook page. The rules for entering this contest also state that you need to “like” Dixie Crystals on Facebook and upload your cupcake picture by May 15, 2011.